If you are trying to find the best drum set money can get you, but you have limited time at your disposal, this comprehensive paragraph should clue you in and help you decide. After taking a good look at what the specialists have had to say on the topic, we have concluded that the Roland TD-4KP is the model that you should invest in. This unit has an innovative folding design that allows its user to take it apart easily and transport it effortlessly. Likewise, the device includes a TD-4 Percussion Sound Module and a total of eight pads. If the Roland TD-4KP is out of stock, consider the Yamaha DTX400K as it is a reliable alternative. 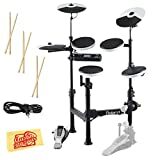 Developed to help you get sonically creative while making your drum journey a pleasant one, this electronic drum set sports features that will enable you to advance. Delivering a wide field of editable sounds and featuring eight pads and an FD-8 Hi-Hat controller, the unit promises to provide natural and rich sounds. The lightweight and foldable design ensures enhanced portability and easy storage. This set is an entry-level kit, therefore, it might not be ideal for more advanced players. Versatile, lightweight, and easy to use and store as well, this set is worth considering if you’re new to drums. Ideal for beginners, this drum set will help you know your sonic personality through a variety of remarkable features without breaking your wallet. The product comes with ten coaching programs, a quiet KU100 pedal, and a convenient input that will help you connect it to an extra mono pad or an additional pedal. You will enjoy 169 added sounds that will enable you to find your sonic path. Silent practice is also possible when using this kit. This drum set model might not be ideal if you’re interested in using it in a recording studio. Find your sonic style with this drum set and you will enjoy versatility, ease of use as well as a cool design. The item includes three 8″ tom pads, an 11″ dual-zone snare, a kick drum pad with a pedal, and three cymbal pads for versatility and natural and vibrating sounds. Furthermore, you get to enjoy a noteworthy range of features that include 70 drum kits, 60 play-along tracks, and up to 600 sounds. Thanks to the USB input, you can use the set with your computer. The user also gets a feasible headphone output and two stereo ¼ inputs. If you want to record more than 5 tracks, you will have to buy a USB stick for extra memory. Providing a remarkable combination of features, this set is a great choice for beginners. Because we know how difficult searching for a quality electronic drum set can get, we have decided to help you. Consequently, we have composed a top of highly appreciated units that you should take a good look at before you make up your mind. If you are a novice in the broad field of electronic music instruments but you still want to end up with a reliable product, we recommend that you invest in the Roland TD-4KP. The most important feature of the unit is its TD-4 sound module that is capable of delivering a wide field of editable sounds that you will undoubtedly enjoy. Moreover, this device comes provided with eight pads in total (such as snare, kick, hi-hat, toms x3, ride cymbals and crash). Likewise, an FD-8 Hi-Hat controller is also part of the deal. According to the manufacturer, the tom and snare pads of the device have cushioned rubber surfaces and, as a result, they provide the player with a rich, more natural sound. Another feature that is very much liked by previous buyers is the portability of the unit. Even more so, this product is known for its low weight and its foldable design that allows the user to transport the model from one place to another with little to no effort. Similarly, because of its smart design, the product can be easily stored in between uses. Overall, the product has gathered favorable reviews from both the specialists and amateur players. If you are a fan of proficient Yamaha violins, but you want to try your hand at a drum set built and sold by the same manufacturer, we recommend that you check out the DTX400K model. This device is excellent for beginners, and it comes provided with a handful of features such as a quiet KU100 pedal, ten coaching programs and a convenient input that enables the user to connect this model to an additional bass drum pedal or an extra mono pad. When shipped, this product includes ten drum kits with 169 added sounds, a drum rack, three 10’ mono cymbal pads, a Hi-hat controller, four 7.5’ mono tom/snare pads, a silent kick pedal and a cable. If you want to, you can use the USB port to connect this unit to your personal computer. Seasoned players that have tried the model have said that this kit is perfect for beginners. However, many of them have stressed the fact that this model might not be the ideal choice if purchased to be used in a recording studio. Still, the device is great if you are interested in a product that will allow you to practice silently at home. Another model to consider if you are on a budget is the Alesis Forge Kit. This unit consists of three 8″ tom pads, a kick drum pad (with pedal) and an 11″ dual-zone snare. Consequently, this model produces natural sounding, vibrating music. What is more, this product has three cymbal pads that offer the user an unlimited range while playing. The product also has a solid mounting rack that keeps it secure and a powerful Forge Drum Module. According to the specialists, this model features no less than 70 drum kits with 60 play-along tracks and up to 600 sounds. A built-in metronome that will help you gain the needed experience is also included. Furthermore, this device comes outfitted with a USB input that will make it possible for you to use the set with a computer. The model also contains a pair of stereo ¼ inputs and a very feasible headphone output. By using this device, one can record five tracks (stored on the internal memory) or up to 99 tracks (if one uses a USB stick). However, the manufacturer does not provide its buyers with USB sticks. Hence, you’ll have to buy one yourself. If you are looking for a device that is dynamic and that is comfortable to play on, be sure to consider this alternate product created by Alesis. This unit is an 8-piece electronic drum kit that comes outfitted with all the features one requires to sound like a pro drum player. 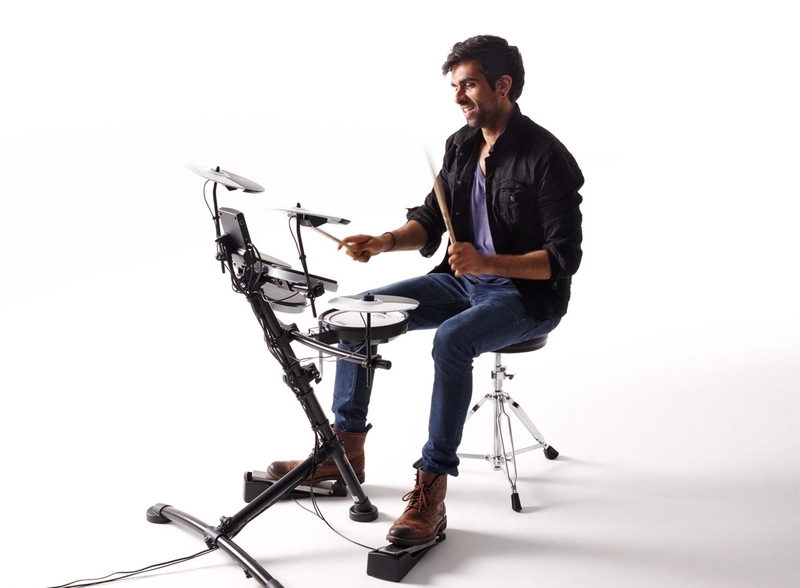 The model includes a kick drum pad (with pedal), three drum pads, three cymbal pads and a snare pad. Besides, the drum and the cymbal buttons come arranged in such a way, so that they resemble the layout of any traditional (drum) kit. Therefore, you shouldn’t find it difficult to use it. Even more so, the device has an aluminum mounting rack that holds the model together once installed. Because the unit is fitted with the Nitro electronic drum module, the model has 40 modern and classic ready-to-play kits, which is a reason why you won’t have any issue creating new music on it. The model comes fitted with six play-along tracks, an advanced sequencer, an onboard metronome and a performance recorder. Thanks to its USB MIDI connection, the device can be linked to both your personal computer and/or your phone. MIDI I/O jacks and a headphone jack are also covered by the price. If you are scouring the internet for an ultra-portable device, the Yamaha DD-75 might be just the product that you may have been searching for. Moreover, the model is said to fit those players that are searching for ways to add percussion to their current setup. Similarly to some other kits that we have analyzed, this unit has a design that mirrors that of a traditional drum set. The product has eight touch-sensitive pads, two pedals and it was created by incorporating a lot of sounds from the well-known DTX-Multi12 electronic pad. The device is extremely light so that you can effortlessly transport it when on the road or when out performing at various gigs. As a plus, this model has an onboard speaker system that many consider being of high-quality. Likewise, its user is said to have total control over the volume of the model, no matter how hard he/she hits the actual drums. The unit has a user-friendly display interface that makes it effortless to switch between sounds and a track recorder (built-in) so that you can record the music that you are playing. The device has to be powered by C batteries (6). Still, an alternative power supply is also provided. If you are a music enthusiast that isn’t afraid of spending some extra money on a reliable unit, the Roland TD1KV is the device for you. This product has a flexible pedal positioning; a sturdy construction that can handle the abuse and it can be easily upgraded (whenever one feels like doing so). Because of its ingenious design, this device is small-sized and easy to transport from one place to another. If you decide to order this model, you will receive a metronome and 15 preset kits (that range from standard kits to electronic, percussion set-ups) and 15 songs to jam with. The product has a headphone output, an auxiliary input and a USB connection that makes it compatible with a computer. The rack of the device has a frame that is shaped like a T. This stand is used as a support for the model’s components. Although the unit might be a bit difficult to set up, once you have mounted it, you will definitely appreciate its sturdiness and its durable built. The product is well liked by its current users, and the specialists consider this set a good investment. If you are still not convinced of its playability, go online and watch the video reviews uploaded by previous buyers. If you want a top-notch model and you are not on a limited budget, the Yamaha DTX532K is another unit that you might enjoy. If you like to experiment with drum playing techniques, the unit’s DTX-PAD snare, the 3-zone cymbal pads, and the real hi-hat should allow you all the liberties that you need. The product includes up to 691 high-quality sounds, and it is said to provide its buyers with practice songs, drum training functions and simple MIDI recording options. Because it was built using the latest technological innovations, this Yamaha model includes features such as smooth snare drum rolls, a cymbal muting setting, and natural cymbal swells. Furthermore, the hi-hat system that the DTX532K uses has a dual-zone trigger pad that can be used for bow and edge sounds. This pad is mounted to the hi-hat stand that comes with the product. As a result, its users will have the option of adding discrete nuances to the beats that they have created. Some of the features that this model comes fitted with are its KP65 Kick Pad, the 7″ drum pads, a PCY135crash and ride cymbal and an XP80 3-zone snare pad. The product is packed with cutting-edge features that all reviewers speak highly of. If you want to purchase an item that mixes the design and the sounds produced by an acoustic kit with the overall convenience of electronic models, this product is our recommendation to you. The model comes fitted with the appraised strike performance sound module that has a 4.3 inch LED screen. Additionally, this module houses an impressive library of sounds (it comes loaded with 1,760 sounds and 100 complete drum kits) that all drummers will simply like. If you decide to buy this item, when delivered, you will receive the renowned Strike Performance module, a premium chrome rack, and three 14’ dual-zone crash cymbals. Similarly, 16” triple-zone ride cymbal, 2” movable hi-hat cymbals, four tom pads of different measurements, a kick drum pad, drumsticks and a sturdy and reliable drum stand will also be included in the deal. According to the previous buyers of the model, this product has a clean-cut design that makes it stand out from its similar counterparts. Likewise, this device is worth the money because of its tunable mesh heads and its wood shells that offer a great response. Moreover, the mixer faders also incorporated in the design of the unit can enable the user to 100% control his/her mix into the headphones or the speakers. If you are a seasoned player that is searching for a professional model, we suggest that you consider the Roland TD-30KV. This device is currently regarded as one of the top units in the market by both musicians and the specialists. The product has incredible playability and unparalleled sound quality, and this is a result of the fact that it was created using the latest sensing technology available. According to its manufacturer, this model was crafted by making use of a new rim sensor that has been specially created for the TD-30KV. What is more, the product comes provided with tom pads that can be dual-mounted and with a snare-stand mountable PD-128S-BC. The new V-cymbals that the device also contains are said to offer a natural swing and to provide the necessary sensitivity all around the surface of the cymbal. From a technical point of view, it is worth noticing that the product includes a TD-30 x 1 drum sound module and four distinct extra trigger input jacks. Although the unit is a bit expensive, most of its current users are content with their investment, and they warmly recommend the product to other interested buyers. If you don’t have a lot of space available, but you still want to purchase a drum set, we suggest that you give the Pyle Electronic PTED06 a good look. This product has a compact tabletop design and it features seven drum pads with touch sensitivity and two digital foot controllers that might come in handy. The model features hundreds of built-in songs, and it allows the user to make his/her own music by connecting the device to a computer (Mac or PC). This way, one can record, save and edit the resulted drum recordings and use them while creating more complex music pieces. The device also includes a LED digital display that has a button control center and a ¼ input jack for headphones. The seller also provides its buyers with a built-in metronome, a wall power adaptor, and drumsticks. You can supply power to the kit by using the included charger or 6 C batteries that you have to buy separately. Previous buyers of the unit have said that the model is worth the investment because of its sound quality and easy setup. Overall, it is worth mentioning that the model offers excellent value for the price. 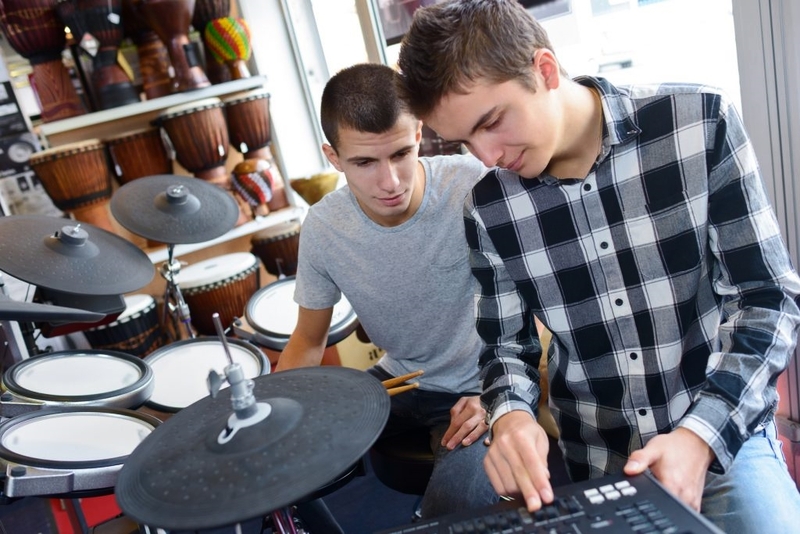 Selecting a good electronic drum set is not an easy task. As you probably know already, the job of navigating through countless technical details is not particularly fun, except if you are a fan of electronics. Because we are well aware of this, we have composed a list of features that you should not ignore when searching for a reliable product. According to reviews of electronic drum sets, when shopping in this line of products, it is prudent that one pays attention to a unit’s sound presence and latency. What we mean by this is that, on the one hand, a prospective buyer should understand that, differently from an acoustic (traditional) drum kit, where the sounds come directly from the instrument, in the case of electronic drums, the music originates from a speaker. Although this difference might strike you as odd in the beginning, once you get used to it you will surely be appreciative of the dynamic of a digital set. Even more so, while playing with an electric model, you have the opportunity of playing silently. In other words, you can connect a pair of headphones to the device and play without worrying that the neighbors or your loved ones will complain about the loud music. This feature is particularly important if you live in an apartment or if you like to practice late in the night when your family wants to sleep. Additionally, a model like this comes provided with plenty of extra features that you will surely enjoy. On the other hand, when speaking about the latency of a unit, we refer to the small delay that you might hear while playing on an electric device. While it is true that the MIDI can actively handle several notes at once, previous users of this type of drum sets have notice that an insignificant delay (mere milliseconds) can be heard while playing such a device. Still, if you are new to learning how to play this instrument, chances are that you might not hear the delay. Again, if you are an experienced musician, you might notice it in the beginning. If you are scouring the net in hopes of finding reliable electronic drum kits for sale, you probably know about the difficulty of deciding between rubber pads and mesh heads. When explaining this difference, most specialists often say that the rubber pads are more similar to practice pads while mesh heads have been created in order to emulate that feel that acoustic drum sets create. What is more, it is worth pointing out that mesh heads are turnable and, consequently, you can actively change the amount of rebound on each head. Even more so, mesh heads are often considered better than rubber pads, especially if one is looking for the sound of traditional drums. As a result, if you buy a cheap electronic drum set, you will most likely receive rubber heads. Size-wise, you should know that mesh is usually closer to the size of acoustic units while rubber is, in most cases, not. Likewise, mesh is said to feel like striking a real drum, while rubber units are not (because rubber is harder to hit). Moreover, rubber pads have what the professionals call stick noise, which means that, when hit, these units are louder and are said to transfer more vibration to the rack and the floor that the rack is standing on. Because of this, when given a choice, many professional musicians pick mesh heads. Still, mesh units also have their disadvantages. For instance, some buyers have noticed that, when compared to the traditional sets, these models are a bit bouncier. If you have read electronic drum set reviews before, you probably know that there are a few extra features that are also important in a product of this type. For one, it is essential that the model that you end up purchasing is compact. Most of the buyers of electronic drums are in search of space-efficient models that can be easily stored in between uses. Yet, this should not be an issue as most models are lightweight and rather small. Furthermore, be sure that the model that you pick comes provided with a metronome, as this will help you play better, especially if you are a beginner. Besides, you might want to invest in a device that comes supplied with a recording function. This way, you will be able to record yourself playing and then listen to see if you have made any mistakes. As a plus, similarly to the technology used when developing a practical beginner electric guitar, some manufacturers outfit their products with inserts for mp3 players and/or smartphones. This way the player can jam along with his/her favorite track with little to no difficulties. If you want a device that can help you improve your playing while practicing, it is advisable that you invest in some more potent units that come with built-in guided training systems. These systems contain various exercises that you will undoubtedly find useful in the long run. Last but not least, if you plan to use your new acquisition to play live, the product that you opt for should have a broad range of quality sounds, and it should be expandable (as in, it should be upgradable). Lastly, keep in mind that it is best that, the product that you end up with should look professional, as most audiences will first judge you by the way you look, and only then, by the way you sound. Because of this, it is assumed that a kit that looks similar to a traditional drum set is better received by audiences than one that is not. Still, your experience might differ, as not all crowds are the same. Similarly to the process of finding reliable electric violas, electric drums are not that easy to obtain. So, pay attention to the features that we have talked about, and we are confident that you will find a unit that you will like. From many points of view, electronic drum sets come with a handful of advantages that you will find useful. For instance, one has total control over the sound produced by the model and can connect the unit to his/her phone or PC and jam along with his/her favorite songs. Still, the quality of the device that you purchase might vary. Therefore, this task is similar to buying other musical instruments. For example, cheap acoustic guitars will not supply the buyer with the same performance as more expensive units. So, if you want a more compact and portable drum set, an electric unit might be what you need. What are electronic drum sets? An electronic drum set is a leading-edge, electronic music instrument that includes a digital sound module that produces the same type of sounds as an acoustic drum set. The electronic units are smaller in size, and they come supplied with a series of features that traditional models do not have. For instance, they are highly portable just like travel guitars. As a plus, the drummer can use headphones with the unit and, thus, he/she can practice silently without disturbing others. Additionally, these models have features that allow the beginners to master the art of playing the drums (such as metronome voices, loops and samples and recording systems). Can you add drums to an electronic drum set? To put it in simple terms, yes. Although this aspect might vary from one model to another, most drum sets allow the user to make many upgrades that can help him/her achieve a better playing experience. If you want to do so, you can purchase extra drum triggers and install them to the device. Nevertheless, every time you do so, you should also add an extra mount. Similarly, you can expand your unit’s capabilities by upgrading the product’s sound module and/or by adding a performance pad to the model. Before investing in any of these features, be sure that the device that you own allows for such improvements. How to play an electronic drum set? To learn how to play the drums, one needs quite a lot of time, dedication, and the help of a few extra features. The first thing that you need is drumsticks. Most units come provided with them and, thus, you should not worry about this aspect. Next, the device that you are using should have a metronome. Because playing the drums requires you to keep a steady rhythm, a metronome can help you achieve the necessary tempo. Last but not least, if you don’t afford a private tutor, we recommend that you go online and that you search for free video lessons. How much are electronic drum sets? Just like in the case of purchasing guitar amps, buying an electric drum can cost you a pretty penny. However, this does not mean that all units are expensive. In fact, the market is filled with less pricey models that cost between 300 and 600 dollars. Still, if you don’t mind paying a bit more, you can always invest in a more proficient unit that costs as much as 1000 or 3000 dollars. This decision is yours, and you should only buy a model that you consider fit for your playing abilities. If you are a pro player, you should get a more potent device. Do electronic drum sets make a lot of noise? Well, no. One of the most significant advantages of electronic drum sets is the fact that similarly to the tech used by a guitar tuner, you get to pick the quality of the sounds and the level of noise made by the unit. Moreover, just like we have said before, this model can be connected to headphones and, therefore you can practice silently, without bothering your friends or family. Additionally, you can invest in an ultra-quiet kick pedal for more convenience. Besides, when you play a gig, an electronic drum set is prone to behave well from all points of view. Also known as a manufacturer that creates outstanding amplifiers that can be used with kids’ violins, Roland is the type of brand that has made a name for itself in the music business. Currently, this manufacturer is considered one of the best designers and constructors of electronic drum sets. Its products are feature packed and extremely playable. Moreover, because they are constructed from high-quality materials, these units won’t let you down. Over the course of time, Roland has gained many customers that appraise the brand for its dedication to creating top-notch products that musicians simply love. As you might know, Yamaha is the go-to brand whenever searching for reliable acoustic guitars, but also digital pianos. However, this manufacturer has also expanded its business, and it is now designing and building proficient drum sets for both beginners and professionals. Like always, the manufacturer is highly acclaimed for its dedication to producing exceptional musical instruments and for its decision to use the latest technological techniques when doing so. The brand is warmly recommended by both previous buyers and the specialists. Its products are easy on the eyes and price efficient. Lastly, Yamaha designs its units from the drummer’s point of view so that he/she gets the complete experience. Another manufacturer that is worth bringing into the discussion is Pyle. Those that are familiar with this brand already know about the outstanding delay pedals that it also produces. Similarly to the previous brands that we have tackled, Pyle delivers price-efficient drum sets that you might find appealing. The electronic sets manufactured by this brand are compact and have space-saving, tabletop designs that all those that are interested in small models are likely to appreciate. Additionally, these units are suitable for beginners that are looking for intuitive devices that do not require that one spends a lot of time installing them. We couldn’t have ended this list without mentioning Alesis. This brand is well known for making electronic sets that come provided with many modern features that cater to the needs of modern musicians. The units that they sell have state-of-the-art designs that are both professional looking and easy to play on. The brand was established in 1980 and, since it was bought by Jack O’Donnell in 2001, it has delivered top-notch products that have acquired the esteem of both specialists and customers. Its products are affordable and innovative and are often regarded as inspiring by musicians and engineers. 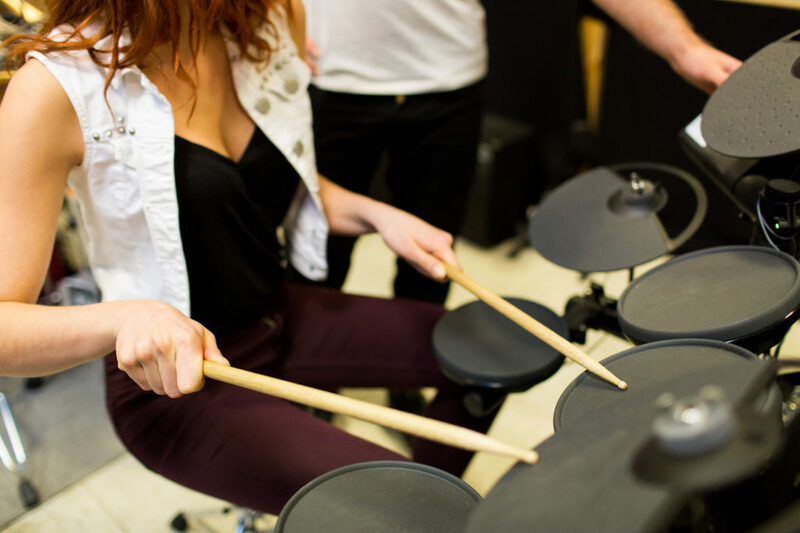 If you are still not sure if an electronic drum set is worth the investment, we have put together a list of aspects that you might want to consider before you place an order. To start, it is worth mentioning that these kinds of devices are versatile. As a seasoned drummer, you probably have to play different styles of music, depending on the gig that you are at. In order to cater to your needs, most manufacturers have designed their sets in such a way so that your job is made easier. Consequently, with an electronic model, you can select the appropriate drum kit sound and use it throughout the night! Moreover, these units are very flexible when it comes to recording. Because they come fitted with an effortless to maneuver recording system, you can now press a button and record that piece of music that has been on your mind all day. Additionally, some products allow the user to edit individual noted so that one gets the sound that he/she dreams of. As a plus, electronic sets are more appropriate when it comes to playing live. These models are space efficient and, most of the time, they are easy to transport. Hence, if you decide to invest in such a product, you will no longer have to worry about carrying the set to the location of your next gig. Likewise, these units allow the user total freedom when it comes to practicing. Differently, from the acoustic models that are somewhat noisy, these devices can be connected to headphones. Hence, you will now be able to play silently at any moment of the day or night that you please without receiving complaints from your neighbors. What is more, most of these items also come supplied with inputs that enable you to connect the drum set to your personal computer or your mobile phone. Once you do so, you will have the chance of playing along with your favorite tracks. Lastly, if you are a novice and you need extra help learning how to play, most electronic sets also have metronomes that can be a real help if you have troubles catching and staying on beat. Besides, these devices have innovative, beautiful designs that you and your band members will surely appreciate. So, don’t waste any more time; start browsing through our suggestions and see what model best fits your needs! 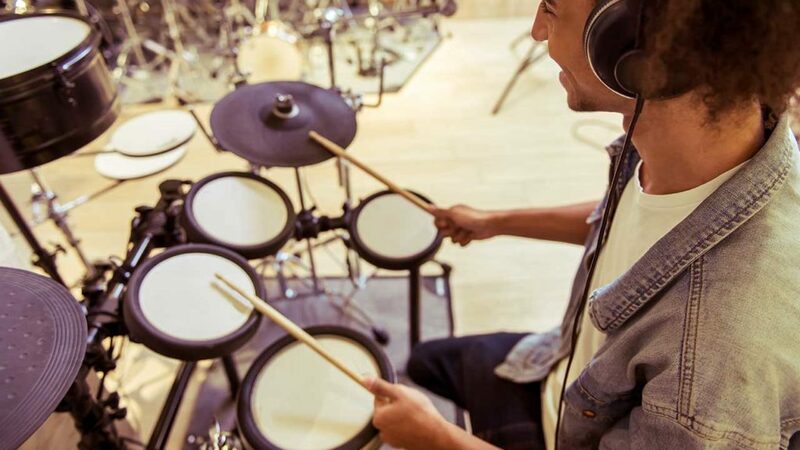 What makes the difference between electronic and acoustic drums? Although both types of drums come with their advantages and disadvantages, electronic models are a practical alternative that you should have in mind. For one, you can play on electronic drums silently by wearing headphones, and you can also modify their volume in accordance with your needs. Therefore, if you are searching for a device that is fitting for somebody that lives in an apartment or in a neighborhood that values silence, this is the type of unit that you should invest in. Also, if you enjoy experimenting with music, you should know that the electric models come fitted with integrated tools that you can practice with. Likewise, the built-in metronomes can help you stay on the beat all the time. As a plus, seasoned drummers have noted that drumsticks last longer with electronic units than with acoustic sets. The motif why this occurs has to do with the fact that they don’t hit sharp edges ad real drum rims. Although this is not necessarily a crucial advantage, you should at least consider it before you make up your mind. What is more, the specialists claim that electric drum kits offer more stick bounce. This happens because the sticks hit rubber pads that are more flexible and, because of this, they don’t lose their tension. As a result, once you develop a personal technique, playing the drums will seem more natural to you. Furthermore, you can plug the digital models into your personal computer, and you can work on your music without using additional technical equipment usually required by acoustic sets. Similarly, you will no longer have to invest in expensive microphones and microphone stands because you can regulate the volume according to your desire. Although this might seem obvious, electronic sets have smaller floor footprints. Because of this, you shouldn’t have issues when it comes to fitting them on small stages. Even more so, these models do not require tuning of any type. You just have to mount them in place, and then you are free to start playing. Before we wrap up this article, we feel that it is vital that we remind you that electronic units are not the same as acoustic sets. Therefore, if you decide to buy a product of this type, you should not expect it to perform and/or feel the same way as the traditional units. Still, given the features that they have, these models are certainly worth your time.